​For this event, participants were invited on a double feature artistic exploration: the photography exhibit "The Other Camera" followed by the play "The Suit!" This event took place on Wednesday, February 19th at 5:45 PM at the Institute for the Humanities Gallery (202 S. Thayer). "The Other Camera" is an exhibit focusing on community photography in pre- and post-Apartheid South Africa, exploring how South Africans represent themselves compared to how they are represented by outsiders. We were joined by Amanda Krugliak, arts curator for the U-M Institute for the Humanities, and professor Jennifer Wenzel. Following the photography exhibit and dinner discussion, participants walked over to the Power Center to see "The Suit," a powerful tale of adultery in Apartheid South Africa. 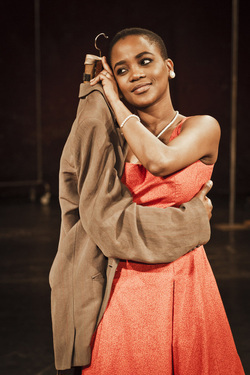 Based on the short story by Cam Themba, "The Suit" is about a man who walks in on his wife having an affair. Although her lover escapes, he leaves behind his suit. As punishment, her husband turns the suit into the third member of their marriage. The play is directed by the legendary stage and film director Peter Brook, whose 71-year career at the Royal Shakespeare Company, London’s West End, Paris's Théâtre des Bouffes du Nord and countless other companies has irrevocably changed contemporary theater. Following the production was a Q&A session. How many times have we listened to the plight of Africans through the voice of a non-native speaker? Countless times, and yet I can count on a mere one or two hands the number of books I’ve read by African novelists, the number of works of visual art I’ve seen by African artists, the number of songs I’ve heard sung by African singers. That’s what was so refreshing and compelling about this night, kicked off by “The Other Camera” exhibit, which included the work only of South African photographers. A look at apartheid and post-apartheid South Africa is very different through the eyes of that “other” camera with which we’re not so familiar. What struck me most about the photographs was not only how boldly colorful some of them were, but also how very ‘normal’ everything appeared: guys and gals dressed in standard 1950s-1970s attire, people getting married, people in bathing suits against a rocky beach, people standing in front of bright swatch of graffiti. Instead of the stark oppression I’ve come to expect when talking about apartheid, I saw happy people, which foreshadowed a theme that I later appreciated in the play we saw next: the day-to-day life of South Africans during apartheid, though precarious in the face of such an unjust and terrible force, was resilient and could be punctuated by solidarity and appreciation of the good that life has to offer. Next up in this double feature night was a play based on Cam Themba’s “The Suit.” It was about apartheid and how precarious a man’s life proved to be after the discovery of adultery by his wife, but in so many other ways, it wasn’t about apartheid. It was about the Black South Africans who lived during apartheid in a part of town where Blacks could own land. It was about making these South Africans human. The play and the actors quite deftly made the characters seem alive in their complexity and vibrancy. I was sucked in from the start, transported by each moment and delighted by the live music that the actor-musicians sang and played. The main actress’s voice was particularly stunning as she sang traditional African songs. Perhaps what was most impressive was the fact that the performance relied on so few props, just a few chairs and dividers that the actors would rearrange to change scenes. I was also impressed by the actors’ engagement with the audience during the performance; some members were even asked to join the actors on stage for a scene. At the talk-back session I had the opportunity to deepen my understanding and reflection of the play when one audience member suggested that the adulterous wife, who suffers in the play, was a metaphor for what might have happened to South Africa had Nelson Mandela not championed the idea of forgiveness and reconciliation in the post-apartheid era. That is, what might have happened if South Africa had not been as resilient as the folks pictured in “The Other Camera.” Between the two events, I thought that this night was a wonderful chance to explore apartheid from the perspective of South Africa. We're sorry, but we don't have any pictures from this event.